STM32Mini, just an ARM STM32 Cortex-M3 mini breakout board. Just a reconstruction from the original 2008 V1.0 version, whose documents were destroyed during a power supply burnout... Fit, form and function compatible ("almost"). There is not much to say about this little project. Most of the pins are available on the two headers JP1 and JP2. 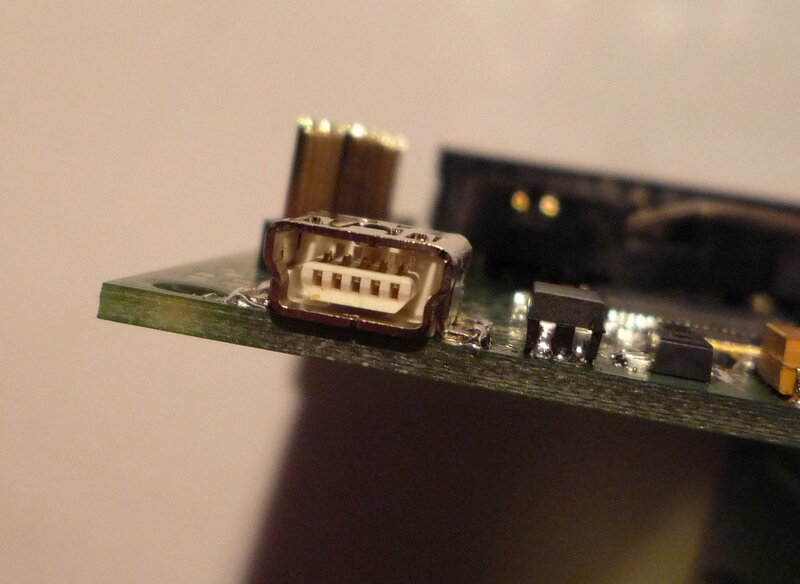 UART1 (MiniFTDI compatible), USB and JTAG (20 pin ARM) have their own connectors. 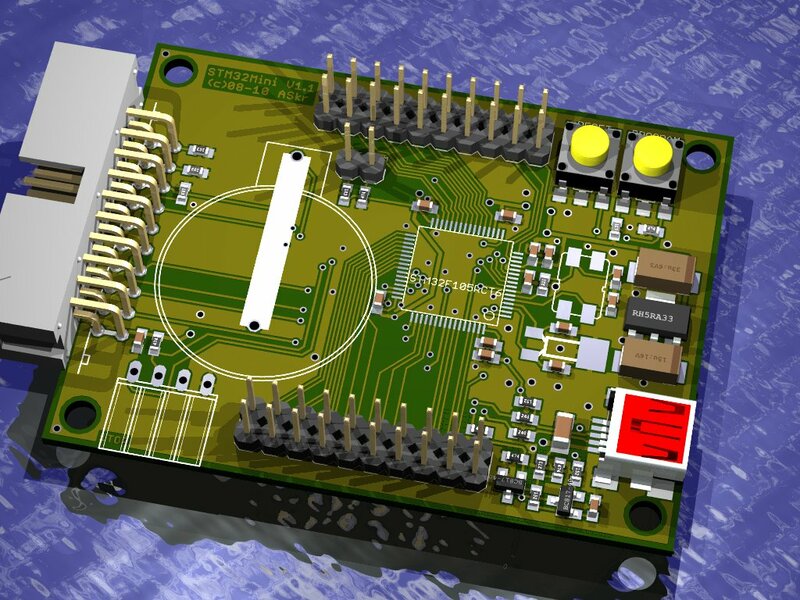 STM32Mini can be powered via USB or one of the headers. The JTAG header has a direct 3.3V connection, JP1 and JP2 are directly connected to USB+. 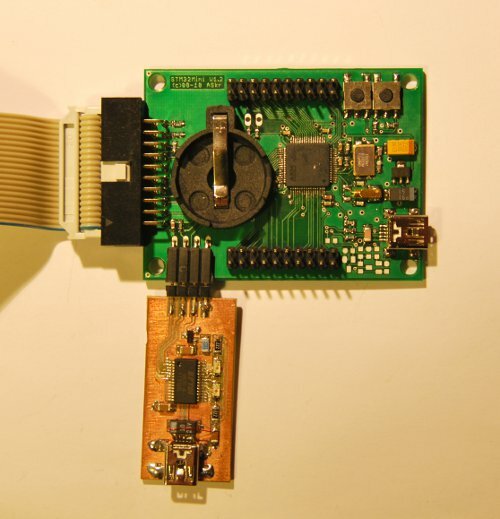 ATTENTION: Do NOT power STM32Mini from both ends, USB and one of the headers JP1 or JP2! 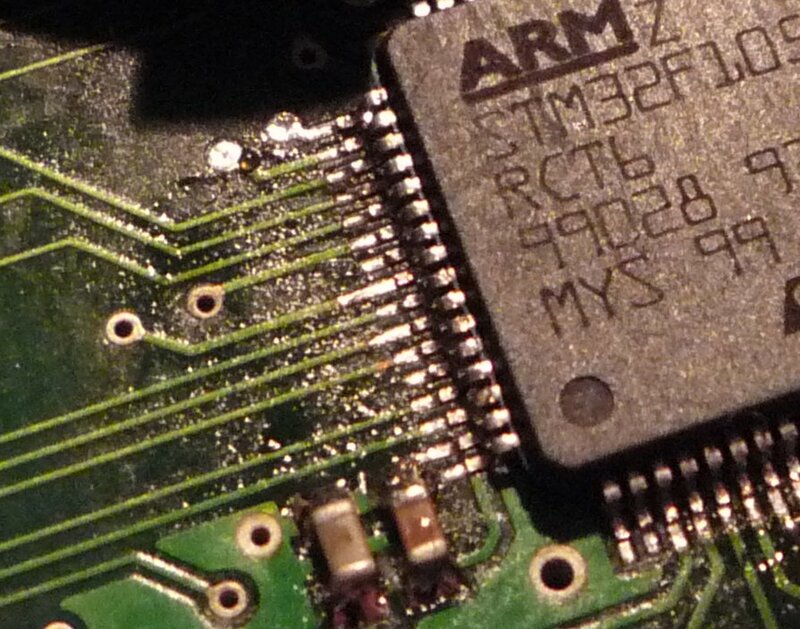 Note: STM32Mini's UART connection of course requires 3V3 CMOS levels. Do NOT directly connect an RS-232! Always attach an USB plug into the mini-B receptacle while soldering. Otherwise, the plastic parts will melt or be	deformed afterwards. For those who prefer a complete, "no guess" IDE, including a complete toolchain, etc..., it might be worth to give Raisonance's Ride7 and RKit-ARM a chance, here. Last but not least, Yagarto. I did not use it that much, but it comes with an ARM compiled Windows (MinGW) version of GDB, including Insight. Direct programming of flash memory is not possible, you need to make a detour via GDB. But reading and verifying memory is possible. Install Cygwin via it's setup.exe program. If you never used Cygwin before, some of this hints may be helpful for selecting packages. Download the newest source version of GDB, here. If the configure script did not find "arm-none-eabi-gcc", etc..., there's something wrong with your Windows path (which is inherited by Cygwin). This should leave two binaries "GDB.EXE" and "GDBTUI.EXE" in the subordinated "gdb" directory. Do not use "make install"; copy these two by your own. This GDB was configured as "--host=i686-pc-cygwin --target=arm-none-eabi". You don't need a special "ARM" version of DDD, a famous GDB frontend. The version that comes with Cygwin will be fine. Just add it via Cygwin's setup tool. DDD compiles cleanly and usually does not need any special configuration. One of the drawbacks of using Cygwin is that it can not share native Windows paths and does not like spaces within them. with subordinated directories for single projects. To overcome a lot of typing and problems that might arise from all that spaces in the path name, it's best to create a Windows batch file, which creates a new drive letter, granting direct access to your project directory. After doing so, you now have a new drive letter "E:" available, which offers a short access to your work dir. Note: Yes, also Ride7 (or CodeSourcery G++) can work in there! 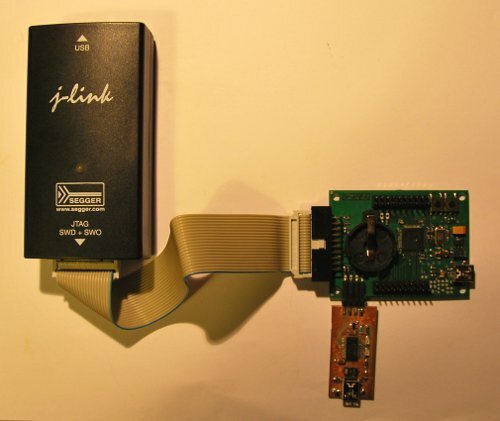 After some programming, connect your hardware to the J-Link and start the J-Link GDB server. It should find your JTAG interface, display its serial number and find a second device, a STM32F105RC in STM32Mini, in this case. Inside Cygwin, preferably from an XTerm, change to your project directory and start your compiled "gdbarm". Tip: Use Midnight Commander ("mc") to change the path without typing! Simply install it via the setup-tool. connect to J-LINK GDB server and change some settings. Target endianess set to "little endian"
Because all of the above will be required every time you start up GDB, it is wise to put this (and a little more [read on]) in a file named ".gdbinit", which has to be present in your Cygwin home directory. All the commands in there will be executed sequentially, just like you would have entered them in the GDB console. After doing all of the above, you are ready to slam your firmware into the processor. Transfer rate: 1456 KB/sec, 303 bytes/write. Transfer rate: 1533 KB/sec, 303 bytes/write. To start your program, type "cont" in the console (or just press the reset button). For a first debug-session, "gdbtuiarm" (or whatever you renamed "gdbtui" to) might be a wiser choice than just "gdbarm". Basically, it is the same, but it offers a source code display at the top. Transfer rate: 570 KB/sec, 292 bytes/write. Breakpoint 1 at 0x80002f6: file E:\TestSTM32\main.c, line 129. The marker will advance to the next line. Hitting "ENTER" one more time, without entering something, repeats the last command, "NEXT", in this case. While "next" executes a single line of code, a "step" command will follow a function call. You now should be inside the function "asSerialSendString()". It's contents will be updated with every "next" or "step" command. At this point, you should start reading the GDB manual. If you are not sure about what version of GDB was started, type "show version" in the console at the bottom. The output should report your ARM-target "--target=arm-none-eabi". Now, read the DDD manual.